If Deep Purple had done nothing more than record “Smoke on the Water,” the band would have earned a place of honor in rock history. Though the riff-based classic (with a true-story lyric about a fire at a Montreux, Switzerland concert venue) has become a cliché among musicians and fans alike, there’s no mistaking its appeal. And the album that features the tune – 1972’s Machine Head – is an undisputed classic. The history of this British band – currently on what may be its final tour – is winding and complicated; since forming in Hertford, England in 1967, more than a dozen musicians have passed through its ranks. The most celebrated lineup is the one that made Machine Head and three other highly regarded albums, but every lineup of the group has created memorable music. Deep Purple’s early music was prototypical progressive rock, with the dramatic organ work of Jon Lord at the center of the group’s sound (Lord retired in 2002 and passed away in 2012). By 1970 the group had changed its style to a heavier approach, but dazzling instrumental work – most notably from Lord, guitarist Ritchie Blackmore and drummer Ian Paice – meant that Deep Purple was always a cut above most hard rock bands. Blackmore left for good in the 1990s; today the guitar position is ably filled by virtuoso Steve Morse, a guitarist who came to fame with the fusion band he founded, Dixie Dregs. Drummer Paice is the sole member whose time with the group extends back to its beginning. Longtime in-demand session keyboardist Don Airey took over when Lord retired, and two members of the prime early 1970s lineup – bassist Roger Glover and vocalist Ian Gillan – have both been back in the fold for many years. Not content to tour and perform as a “legacy group” playing oldies, today’s Deep Purple showcases both its classic material and songs from its two most recent albums, 2013’s Now What?! and Infinite from 2017. Both produced by Bob Ezrin (whose credits include Pink Floyd, Alice Cooper, Kiss, Peter Gabriel, Phish and many others), those albums earned critical praise. “Time for Bedlam,” the leadoff single from Infinite, balances melodrama, pounding riffs and muscular, flashy instrumental pyrotechnics. 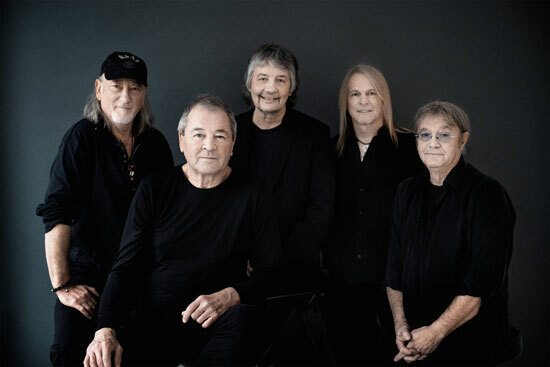 In the midst of what the band is calling its “Long Goodbye Tour,” Deep Purple’s current sound is contemporary melodic hard rock, rooted in the classic style that earned the band its reputation as masters of the genre.